CARLA NEGGERS Blog Tour for DECLAN'S CROSS kicking off in September! Two weeks ago I was contacted by a media company to see if I was interested in hosting a Blog Tour stop for Carla Neggers’ latest book Declan’s Cross. I was ecstatic, though I confessed that I didn’t know how to do it, so I would instead promote the Tour, which is kicking off on September 12 across the blogosphere, and post a review on September 19. 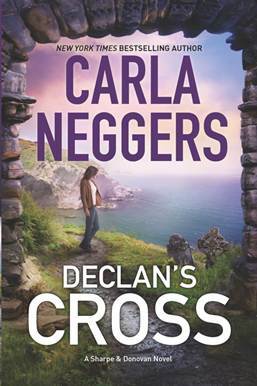 So please tune in for my review of Declan’s Cross by Carla Neggers on that date. "Heron's Cove gives romantic suspense fans what they want...complex mystery with a bit of romance. Negger's skillfully created a compelling puzzle, refusing to reveal all the pieces until the very end." "Once in a while, a writer who's been at it seemingly forever reaches a new pinnacle. Such is the case with Carla Neggers in her latest superb adventure of romantic suspense!" At a young age, Carla began penning her own stories on a branch high up in her favorite sugar maple. Now she enjoys spending time at the family homestead (now a tree farm) with her six brothers and sisters and their families. When she’s not writing, Carla loves to travel, hike, kayak, garden, and, of course, dive into a good book. She lives with her family in Vermont, near Quechee Gorge.